TGFS Swag Shop- NOW OPEN! TGFS 2018 T-shirts and buttons now available for purchase! 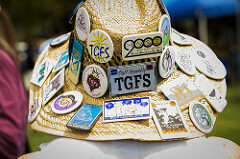 Buy a TGFS 2018 T-shirt and button to sport your UC Davis Staff pride! The shirt features this year's TGFS 2018 logo and our generous sponsor's logos on the back! These shirts and buttons are collector's items that show your campus spirit, so buy one today and be sure to wear it on May 16, 2018 for TGFS!